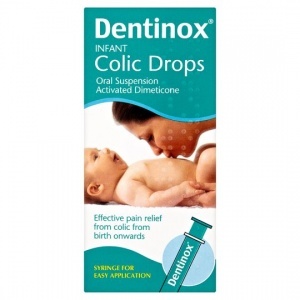 Give baby Dentinox Infant Colic Drops with or after each feed. There are 2 ways to give the drops from the spoon provided or by adding it to baby's bottle. A 5ml spoon is provided with 2.5ml embossed on the inside scoop of the spoon. Do not give more than 6 doses a day. You can use the drops from birth onwards. If symptoms persist speak to your health visitor, pharmacist or doctor. See package leaflet for further information. Do not store above 25øC.